Categorized as: Africa, Asia, Education, Grantee, Leadership, Middle East, Our Partners, Poverty Alleviation, Stories, Storytelling, U.S., Youth & Tagged as: Anniversary, Fundraiser, Human rights, Oral history, Story collection on June 20, 2015. Voice of Witness celebrates ten years of impact by releasing a volume of narratives from over the years, edited by cofounder Dave Eggers. Our foundation fervently believes in the power of strong storytelling. Last year, we were fortunate enough to begin supporting Voice of Witness work. Voice of Witness is dedicated to fostering a more nuanced, empathy-based understanding of contemporary human rights crises by amplifying the voices of men and women most closely affected by injustice, and by providing curricular and training support to educators and invested communities. To mark a decade of inspiring storytelling, Voice of Witness co-founder Dave Eggers has edited narratives from their many volumes to create a compelling compilation titled The Voice of Witness Reader: 10 Years of Amplifying Unheard Voices. Learn more about Voice of Witness’ 10th anniversary Sustain the Story campaign by clicking here. 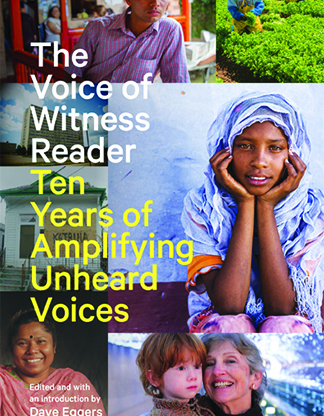 Order the The Voice of Witness Reader: 10 Years of Amplifying Unheard Voices by clicking here. DONATE directly to Voice of Witness here.